Samples and evaluation kits of industry’s first 3D SSL system-on-chip ships to first partners for autonomous driving applications. QUEBEC CITY, August 9th, 2018 – LeddarTech has delivered the first A-samples of its LeddarCore LCA2 system-on-chip (SoC) to select automotive partners that will be publicly disclosed at a later date this year. 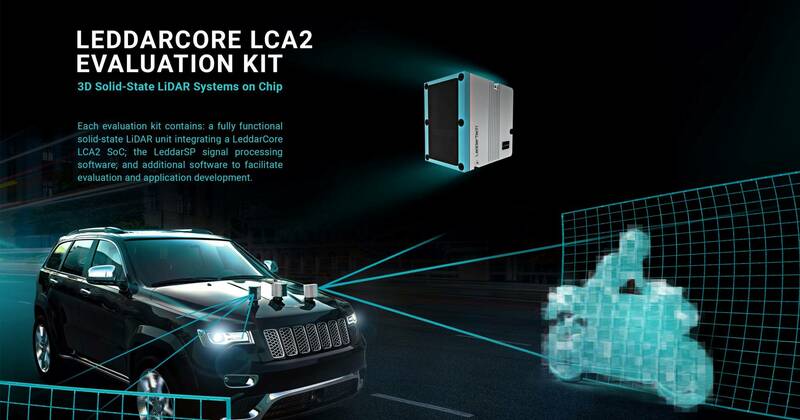 The LCA2 is the autonomous vehicle industry’s first 3D solid-state LiDAR (SSL) SoC and is available now to Tier-1 automotive manufacturers and system integrators via purchase of the LeddarTech LCA2 evaluation kit. High-volume delivery of the LCA2 will begin in the first half of 2019 for deployment in Autonomous Driving (AD) and Advanced Driving Assistance Systems (ADAS). The LCA2 uses LeddarTech’s LeddarSP signal processing software to produce raw LiDAR data such as distance, position, and intensity of echoes. LCA2 is suitable for a wide range of applications, can be produced in high volumes for rapid mass-market deployment, and is ideal for SSL used in AD/ADAS. LeddarTech’s LiDAR technology is supported by an IP portfolio containing 58 patents (44 granted, 14 pending). Tier-1s and OEMs that order an evaluation kit are able to immediately begin application development and integration efforts of their custom LCA2-based LiDAR. To accelerate and support partner development of LCA2-based LiDAR, LeddarTech is providing engineering services and access to the company’s SSL experts. LeddarTech’s ecosystem partners are also supporting customers in making the proper selection and integration of key components such as lasers and photodetectors. Interested in automotive LiDAR implementations leveraging the LeddarCore LCA2 SoC? Inquiring about the acquisition of a LCA2 Evaluation Kit?